A study by the University of Exeter provides the first evidence that coral reefs can recover from the devastating effects of climate change. Published Monday 11 January in the journal PLOS One, the research shows for the first time that coral reefs located in marine reserves can recover from the impacts of global warming. Scientists and environmentalists have warned that coral reefs may not be able to recover from the damage caused by climate change and that these unique environments could soon be lost forever. Now, this research adds weight to the argument that reducing levels of fishing is a viable way of protecting the world's most delicate aquatic ecosystems. Increases in ocean surface water temperatures subject coral reefs to stresses that lead quickly to mass bleaching. The problem is intensified by ocean acidification, which is also caused by increased CO2. This decreases the ability of corals to produce calcium carbonate (chalk), which is the material that reefs are made of. Approximately 2% of the world's coral reefs are located within marine reserves, areas of the sea that are protected against potentially-damaging human activity, like dredging and fishing. The researchers conducted surveys of ten sites inside and outside marine reserves of the Bahamas over 2.5 years. These reefs have been severely damaged by bleaching and then by hurricane Frances in the summer of 2004. At the beginning of the study, the reefs had an average of 7% coral cover. By the end of the project, coral cover in marine protected areas had increased by an average of 19%, while reefs in non-reserve sites showed no recovery. Professor Peter Mumby of the University of Exeter said: "Coral reefs are the largest living structures on Earth and are home to the highest biodiversity on the planet. As a result of climate change, the environment that has enabled coral reefs to thrive for hundreds of thousands of years is changing too quickly for reefs to adapt. "In order to protect reefs in the long-term we need radical action to reduce CO2 emissions. However, our research shows that local action to reduce the effects of fishing can contribute meaningfully to the fate of reefs. The reserve allowed the number of parrotfishes to increase and because parrotfish eat seaweeds, the corals could grow freely without being swamped by weeds. As a result, reefs inside the park were showing recovery whereas those with more seaweed were not. This sort of evidence may help persuade governments to reduce the fishing of key herbivores like parrotfishes and help reefs cope with the inevitable threats posed by climate change". • A coral reef is made up of thin layers of calcium carbonate (limestone) secreted over thousands of years by billions of tiny soft bodied animals called coral polyps. • Coral reefs are the world's most diverse marine ecosystems and are home to twenty-five percent of known marine species, including 4,000 species of fish, 700 species of coral and thousands of other plants and animals. • Coral reefs have been on the planet for over 400 million years. • The largest coral reef is the Great Barrier Reef, which stretches along the northeast coast of Australia, from the northern tip of Queensland, to just north of Bundaberg. At 2,300km long, it is the largest natural feature on Earth. • Coral reefs occupy less than one quarter of one percent of the Earth's marine environment, yet they are home to more than a quarter of all known fish species. • As well as supporting huge tourist industries, coral reefs protect shorelines from erosion and storm damage. There is also another process involved when fish populations rise. They secrete calcium carbonate in these regions by using the CO2 in the water. The more CO2 the more bioavailable calcium carbonate. This is quite good news, actually--well, not for AGW alarmists, anyway. This is one more of the ocean's many natural ph buffering mechanisms. The more calcium carbonate available the harder it is for the oceans to truly acidify. The higher the available soluble calcium carbonate the more acid that is neutralized. In addition, it means more bioavailable calcium carbonate for those lifeforms that use it to manufacture their shells and other carbonate structuresm such as corals. The truth, people will find, is that climate change acid oceans are more the stuff of myth and alarmism than fact. The times when acidification really happened (at least, when they think they 'really' happened) usually occurred as a result of catastrophic processes also seen in some of the evidence. Coral reefs have been around for 400 million years, During that period, CO2 levels have been many multiples higher than current levels. Sea level rose and fell like a yo-yo. The coral survived. You don't need a grant to figure out that coral therefore must be able to adapt to climate change. (CO2 also provides the carbon which these organisms require to grow. More is better for them, just as it is for plants.) ... As for AGW, the models do not account for CO2 added to seawater by undersea volcanism; no one even knows what order of magnitude this effect is in relation to human-generated CO2 --- but it is surely very large as 85% of the world's volcanoes are underwater, and just one major volcanic eruption can change climate. "Bleaching" of coral reefs is one way Bahamians chose to fish. It's illegal, but dumping a gallon of Clorox into the water over the reef kills all the fish which then float to the surface to be harvested. "Bleaching" of coral reefs is one way Bahamians chose to fish. It's illegal, but dumping a gallon of Clorox into the water over the reef kills all the fish which then float to the surface to be harvested." Sancho - I have seen similar things happen in Canada with explosives. I used to work in a mine and knew people that would snitch some stick explosives, set them off on a nearby lake and resulting the dead fish would provide supper. I still wonder about the rapidity of the ocean acidification. Yes, it has happened before in the 400 million year existence of coral reefs - but natural processes are tied to geological time scales, giving the reefs time to 'mount defences' - develop biological mechanisms to ensure survival. Whereas we are increasing the acid level at what is a fraction of the time previously used. Would this not have a large effect upon the survival possibilities of coral? I am not sure whether anyone really has done anything relative to the DNA of the coral algae to check for mutation. I also know that pollutants from land that make their way into the oceans do have a negative impact on sea corals and other sea fauna and flora. Another problem is the rise of UV radiation that has made its way to the surface. Since the solar minimum UV radiation reaching the upper atmosphere has reduced so it is likely that the same can be measured for the reefs. In several cases of coral bleaching caused by increases of the temperature in, say, the Caribbean, the algae population was replaced by a hardier algae that are more adaptable to to rises in temperature. This has actually been observed in at least a couple places around the world. As to those who say that we have increased acid levels in the sea, we have no real evidence of that considering that the ph of sea water still is slightly alkaline >7.0. 7.0 is the ph of pure water. There have been many such studies. Corals are robust and regenerate quickly. They are one of the oldest and most adaptive life forms. Stories of their demise are greatly exaggerated, just part of the massive AGW liar lore. If you repeat lies often enough, people start to believe them. Ok poeple are forgetting about climategate. There is no evidence that hasn't been corrupted showing global warming. If you build your premise on garbage then your premise is stinky. Global warming has nothing to do with the coral damage. How about we find out WHY coral is dying, don't just blame it on junk science. Maybe if we do, we can find a solution. "Bleaching: In recent years, Bahamian fishermen have introduced the use of household bleach for the taking and capture of crawfish and scalefish. Bleach fishing is very destructive. 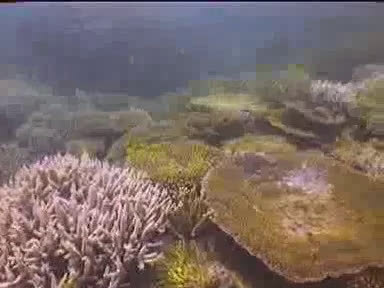 Bleach kills the reefs and the coral becomes overgrown with algae or green moss. Some reefs are taken over by sea urchins. Most fish will leave the area of a bleached reef. One gallon of bleach can poison about 500,000 gallons of sea water!" Stay calm, no need to panic. Especially if you love nature. Climate has never done anything but change, and it's changed far more quickly on it's own more than once in bringing you this world which you are very much part of. You are part of nature, not separate from it. The misanthropic Malthusian garbage peddlers would love for you to think differently, and this is why religion and politics have no place in science, they both need to be checked at the door, science is observation, politics is manipulation, religion is faith in that which can't be observed. With science we have the Baconian or scientific method and Popperian logic to help us vet which theories are credible. Private commercial research of the patentable type may be secret, but research of the climate variety paid for politically with public funds is not. To believe in AGW or similar speculation and be science minded you will need more than 'faith' in secret computer models or it's just your religion and politics. Coral bleaching is the expulsion of the symbiotic algae that produces the sugars that coral polyps eat. When the algae is pushed out by the coral's immune system the coral becomes white in color, hence coral bleaching. As for using bleach to fish, that's ridiculous. I think you're referring to sodium cyanide fishing, inappropraitely called "bleach fishing" as it kills the symbiotic algae causing much the same look and effect as bleaching something would. Your assertion that somewhere along the line someone confused sodium cyanide for sodium hypochlorite certainly would seem more plausible given California's over reaction to chlorine toxicity skepticism is warranted. At: Freethinking: Solutions help, alarmism only hinders solutions, agreed. Both methods are used around the world. In the Bahamas it is sodium hypochlorite but in the oceans around Southeast Asia it is sodium cyanide. Both are destructive to corals the world over. The 500,000-gallon statement was made by the Bahamian gov't agency, not me. Coral reefs have been around for 400 million years, During that period, CO2 levels have been many multiples higher than current levels. Sea level rose and fell like a yo-yo. The coral survived. You don't need a grant to figure out that coral therefore must be able to adapt to climate change. This makes no sense. Yes: life can adapt to SLOW changes in the environment. But we are talking about man-made (i.e. very fast) changes here. It's the difference between evolving scales to feathers to wings over millennia and pushing someone off a cliff and expecting them to learn how to fly on the way down. The former is possible the latter...not so much. We should not yet be talking about man-made changes because there is as yet no definitive evidence that such is the case here. This decade (1999-2009) has seen an overall cooling trend. 2009 was said to be the ninth warmest year since the early industrial age (meaning that it actually was the second coolest; gotta watch the use of terms here). Now, what do we see when we look at all the available proxies before their data got smoothed away? We see declines all over the place. We see the same in satellite data. We see the same in the raw ARGO data (that will be gone as they will be smoothing that data pretty soon). Remember that pH is on a logarithmic scale. So the change from 7.82 to 7.78 is pretty substantial (about 10% in total numbers ... which is a LOT for biological systems to cope with. Imagine what a change of 10% UV would do to skin cancer rates for example). Smaller organisms do not have buffer systems like larger ones so they are much more directly affected. The advantage of smaller systems is their numbers which give them a high number of mutants per generation and therefore a big chance for one of these to be able to survive. But one should note that this means a lot of the others dying out and a very small population surviving/repopulating the environment - which in itself holds other dangers (small starting populations mean little diversity and high susceptibility to new environmental dangers). Coral reefs can repopulate this way but this makes them extremely susceptible to a one-two punch. We've already given them the first punch. It is time we pull our punches. Well, put a coral in these 'fluctuating bottles of water' (whatever you meanby that) and see if they survive. I'm not asking you to be reasonable. I'm asking you to be realistic. Well, there is his misunderstanding of pH flux and there is also the problem of where a number of the readings were taken. In a number of these areas there is current volcanic activity. Volcanic acid salts as well as massive amounts of CO2 being blown through the water by nearby undersea volcanoes are going to have a degree of effect on overall pH flux in the oceans. I suggest waiting for these factors to rest a bit and retaking the measurements. Then again, there still will be flux in overal pH as there always is in the oceans due to many factors. I came across an interesting chart today. 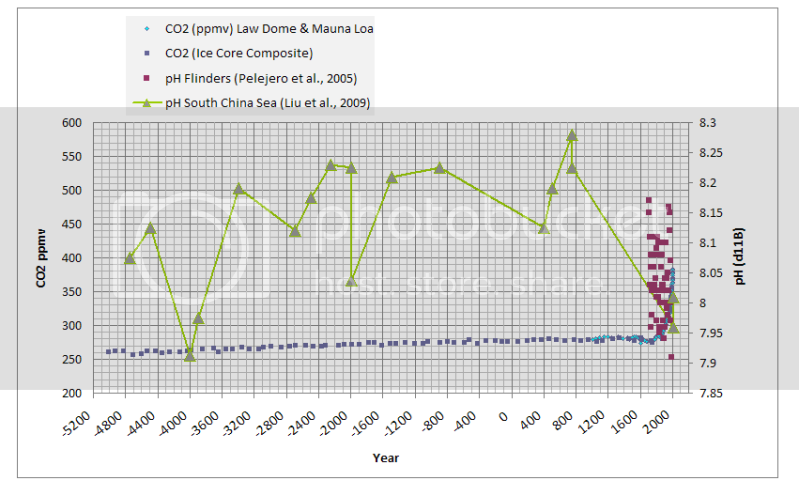 It shows pH levels and CO2 levels for the South China Sea for 7200 years time. The data is current, being taken and published in 2009. Notice that--if the data is correct--we still, in spite of a drop in overall pH, are within historical parameters as shown by the data for the -4000 mark. There is not yet a need for alarm, therefore. Just to be fair (hockeystick-wise) is there any indication of why the big drop around 800CE? Was it a real drop or was there a different method of measurement giving significantly different results? To be straightforward and fair, the authors of the original study themselves believe quite strongly in AGW. They seem to be saying that the larger part of the drop from 1800 on was or is caused by humans and CO2 emissions. I find that interpretation quite odd considering the substantial drop beginning in 800. But, no, the data in Liu et al., 2009 was measured across the board using &#948;11B (Boron isotope) proxies in the form of porite coral. Also in the chart above, however, are the results of Flinders pH measurements by Pelejero et al., 2005. Consider the sharp flux in that data, too. Liu et al. speculate that "variations of monsoon intensity during the mid-late Holocene may have driven the sea surface pH increase from the mid to late Holocene." Volume 73, Issue 5, 1 March 2009, Pages 1264-1272. That is annoying. The delta character got changed into Unicode encoding but did not display correctly. So, read delta-11B in place of &#948;11B above. The more simple a lifeform is the faster it can adapt. That being said, corals are very, very basic forms of life. Not true, whilst hard corals have been around for hundreds of millions of years the species present today are relatively recent, highly developed and evolved to their current conditions. Like other areas of high biodiversity specialisation is required to survive in an ever increasingly competitive environment. Unfortunately this makes them very susceptable to even small changes in their environment. No. He'll just one-rank you and wash his hands of the question. "The fossils found since the mid-Triassic period show corals with aragonite calcification, species such as we see today (15)." Interesting thread, seems someone is up to their old tricks of sidestepping issues by demanding something they never supply. i.e. references! Typical troll. Would he provide a link to, say photosynthesis, if discussing plant adaptations to woodland shade or would he consider it so basic it shouldn't need to be referenced? I have a link I would like to share showing the phylogeny of hard corals from an interesting paper discussing the evolution of corals from deep sea to shallow water. It shows that most studies species came about during the last 30 million years with many in the 5 million years. Link to follow in next comment. Here it is http://docs.googl...2008.pdf hard coral species evolution diversification&docid=1a623b93ac71dcebe7a3f80cd71d3d05&a=bi&pagenumber=3&w=712. I never made any such assertion above. And, I do not sock-puppet. Nonetheless, it is true that in the scale of things--and in spite of a complex tree of phylogenetic and morphological diversity (which complexities I have never denied)--these coral creatures still are on the same order as jellyfish and sea anemonies. Corals reproduce sexually, asexually, and by budding, depending upon circumstances and species. On the scale of things they really are quite simple life forms in spite of your peurile attempt at making them more complex than they really are. In short, complex phytogenetic trees != complex lifeforms. One thing else: What do delta-18O and other proxies tell us about pCO2 levels ppm and temperatures during the Cretaceous to 65 mya? The amount was higher than today, and much higher before. It will go a little over your head but you will get the picture. To describe these creatures, many in symbiotic relationships as 'simple life forms' is primary school education at best. Jellyfish and anemonies are indeed very complex life forms, as are corals, nematodes, arthropods and indeed bacteria. Why do you want to deflect the discussion off topic? I'm sure if it is relevant to a topic then it can be discussed. Do't want to annoy the moderators do we. Yes, I did mean to type 'phylogenetic', just as I actually did type 'phylogenetic' two paragraphs above that typing error. Yes, I was using one hand at the moment I typed that sentence and I acknowledge I mistyped at that moment. In addition, at the time I was reading a study concerning the use of certain phytochemicals (note the use of 't' in the word) in Ayurvedic medicine and the use of the substance in the treatment of inflammation and wound care. But, a careful reading of my comment would have revealed that I did indeed know the correct spelling and usage of the correct word in spite of a following typist's error. I have read the article and it does not say what you think it to say. Symbiotic relationships != complex lifeforms. On the scale of things, sea corals are not all that complex compared to say, a fish. If the study holds true that algae and corals have indeed been involved in gene transferrance, that would argue for something which certain bacteria are known to do and would tend to make the case that corals are even simpler forms of life in many respects than previously thought, as well as make a case for their resilience in the face of change. Careful. You could be undermining your case even further than you thought. The fact is, these forms of life formed the symbiotic relationship during the Triassic, as the above linked article you posted states, which indeed shows that the corals have undergone and survived extensive changes in overall CO2 and O2 levels in the sea--in some cases rapid changes. Thanks for that article. It provides interesting evidence against your position on several fronts. It is strong evidence that a mechanism existed since the Triassic that may ensure coral survival. By the way, I never noticed any answering of the question asked above regarding levels of pCO2 during the mid-Triassic and Cretaceous down to 65 mya. It is not a change of subject and is highly relevant to the subject of corals surviving climate change. The evidence suggests rather strongly that they will survive and will bounce back overall from climate change even on the order of catastrophic climate change as is evidenced from the proxies from the mid-Triassic to the present. Again, what were the levels ppm of pCO2 during the relevant time period of the evolution of the kinds of aragonite corals we see today? This question is most pertinent to the question of coral surival and recovery. Sorry Dachpy/velan (You two must be the same, right?) but MikeyK is right here. Corals, including symbiotic corals are indeed complex organisms, they have to survive in a very hostile and competitive environment. Their body chemistry works in a narrow window regarding light, temperature, pH and pressure. Any changes to these factors can mean some of the more specialised corals will lose out to the 'generalists' resulting in a loss of biodiversity. Unfortunately hard corals, once established, find it difficult to move! You also seem to be confused about the nomenclature of corals, symbiotic corals have their scientific label, as do the symbiont's. However it is not unusual in biology to have two symbionts so totally independent on each other that they have one specific name, for instance the lichens. Ummm, no. We are not the same--unlike you and MikeyK. Sorry MikeyK, but increased biodiversity in the corals as well as in other forms of life took place explosively during times of high CO2. That is what the evidence suggests. Time to update. Sorry, nothing to with MikeyK. We may have similar points of view but are not the same person. I'm not sure what your reasoning is about high CO2 and 'explosive' biodiversity. High CO2 occured after the KT event (caused by the Deccan Traps which was probably triggered of by the asteroid). 98% of colonial corals (those that make reefs etc) were wiped out, compared to around 60% of other corals. After this time there would be an 'explosive' as you call it rise in speciation. As reef building corals only occur ten million years after the Triassic actually started in the fossil record I wouldn't find it surprising to see rapid diversification. Ummm, no. Reefbuilding corals have existed from at least 450 millions years ago--before the beginning of the Triassic. In fact, what is (or was) believed to be the world's oldest known coral reef is believed to be 450 millions of years old and is located at what is now Lake Champlain. However, aragonite corals similar to what we see today do appear to have had their beginning during the Triassic. K-T and Deccan Traps occurred at and after the end of the Cretaceous. My question is specific to the period preceding these. Furthermore, the fact is that corals survived mass extinction events and rapid climate change. Your argument supports that. Levels of pCO2 also were on the order of 2,300 ppmv within 10,000 years of the KTB. The corals survived that! Many died off but many more came afterward during high CO2. But, you also did not answer the question asked above. That question again was: What levels of pCO2 occurred during the mid-Triassic to the end of the Cretaceous 65 mya? Increasing CO2 = Higher global temperatures = Higher ocean temperatures = reduced oxygen levels = increae in organisms that prefer low oxygen/anoxic conditions such as the Cyanobacteria= coral death. My god, I think you've actually got to some understanding! Of course the end of the Permian was when the cyanobacterium ruled the world as it were, also as a result of global warming. What were the levels of pCO2 ppmv between the mid-Triassic to 65 mya? Is that question really so hard for you to answer to answer? The easy answer is that levels were higher than today and the corals thrived. But, this is not the precise answer I am asking of those who think increases in CO2 are going somehow to kill off coral. The fact of the matter is, and the evidence of millions of years shows this and is in keeping with the title of the article above, coral can recover from climate change--even catastrophic climate change. What man has introduced into the atmosphere pales in comparison to natural climactic events. The central point is, if corals survived mass-extinction events and truly catastophic climate change, what makes you or any other AGW believer think current levels of CO2--puny by comparison--will damage corals beyond recovery? I noticed that I missed responding to this part of the above comment. I never said that jellyfish, sea anemonies and corals "belong to the same Order" above (this would be a rather foolish thing to say, yes?) so this is yet another example of your misreading of the texts of others. I would be very careful in maintaining a status quo Permian Extinction Event of the above nature that Benier_Duster implies. We should wait on deciding such a thing until the jury is in. It still may have happened but not necessarily the way commonly maintained. As the article suggests, some of the evidence of geological "dead zones" may not be the evidence it is cracked up to be. Nonetheless, it is of interest if even part of the story is true in spite of new findings. Corals evolved and developed in anoxic seas. This would make sense because of the adoption of a symbiotic relationship with algae that ensured coral survival in anoxic waters, a relationship which would have provided oxygen to the animals in an anoxic environment and increased their chances of survival and competition. You have a few relationships backwards there as well as overly simplifying the process. The atmosphere does not have the ability or potential to warm the oceans being the most glaring of your miscalculations. Oh dear oh dear, mis-reading again are we? I never stated that the atmosphere warms the ocean, I stated that warmer atmosphere = warmer oceans. There is less heat loss from oceans when the air above it is warmer, and more when the air above is cooler (disregarding for clarity the wind speed), duhh. We all know and take it for granted that the sun heats up the ocean, why deniers have to keep mentioning this is a mystery, but I suppose they are trying to learn the basics. Well, you actually did say that as one of your sockpuppets and now you are disputing with your own sockpuppet? Because you now realize that your sockpuppet was overly simplistic? Fascinating. Nonetheless, you still leave unanswered the question above regarding CO2 levels ppmv from the mid-Triassic to the end of the Cretaceous. What were they? Fact is, corals evolved in anoxic waters and are genetically capable of handling such conditions. In addition, as is clear from the above article and others like it, coral can recover from climate change damage--even catastrophic climate changes of the kinds survived by aragonite corals.